When SHOEI first introduced the NEOTEC in 2011, riders worldwide realized not all modular helmets were created equal. With its lightweight, highly aerodynamic shell, advanced noise reduction, and optimal vision protection, all combined with an ease of use (critical to a modular helmet), SHOEI had indeed achieved new heights in head gear design. But that was just the beginning. Now, with the NEOTEC II, SHOEI has not only improved on already outstanding features, but also introduced design advances to bring their premiere modular design into a whole new era. The NEOTEC II?s improved ventilation system has been wind-tunnel tested for cool air intake and hot air expulsion. Large upper and lower vent shutters offer greater ease of use with gloves. The expanded three-position upper air intake helps increase ventilation performance and adjustability. All-new exhaust outlets flank the upper air intake vents for improved hot air clearance. Helmet aerodynamics have been wind tunnel-tested, and optimized to accommodate varying riding positions. The NEOTEC II?s shell-integrated spoiler is now reshaped and repositioned to further reduce lift and drag. The helmet?s top air outlet also serves as a spoiler when riding in the upright position. Chin bar aerodynamics are improved by the newlydesigned ?Aero Deflector?. The Micro Ratchet Chin Strap is a 100% stainless steel interlocking mechanism which offers quick and smooth closure and opening, comfort, and is easily adjustable. The NEOTEC II?s enhanced shell shape has been designed to improve noise control. A new airtight window bead, along with the face cover?s ?Vortex Generator? lip, help reduce noise and manage overall airflow. 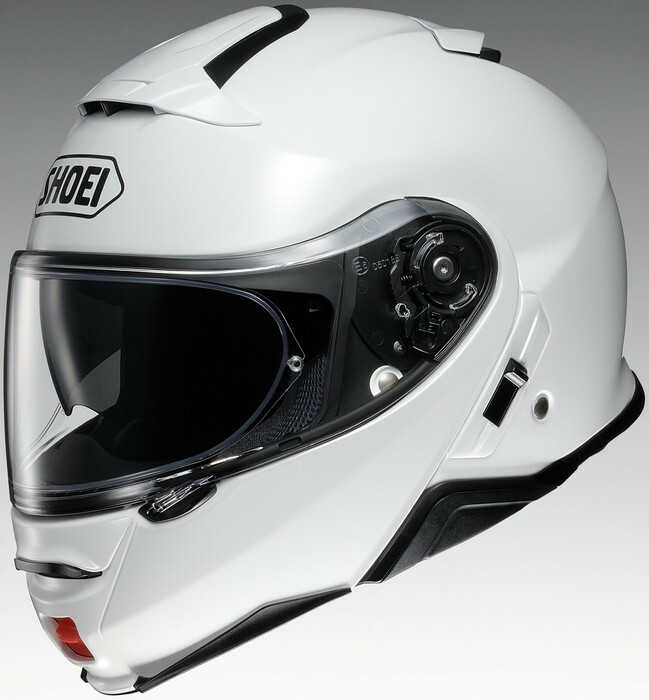 SHOEI also developed new ?Noise Isolator? cheekpads that deflect wind, as well as reduce unwanted noise. The NEOTEC II?s Flip-Up Face Cover is designed to convert instantly from a full-face to an open-face configuration with the simple push of a large lock release button located at the chin. The Face Cover holds firmly in the open position with the help of the all-new 360? Pivot Locking System, which assures a safe, secure closure when the cover is in the down, locked position. Lightweight Face Cover/face shield rotate with smooth precision on a variable eccentric axis, yielding the seamless versatility of a two-in-one design. 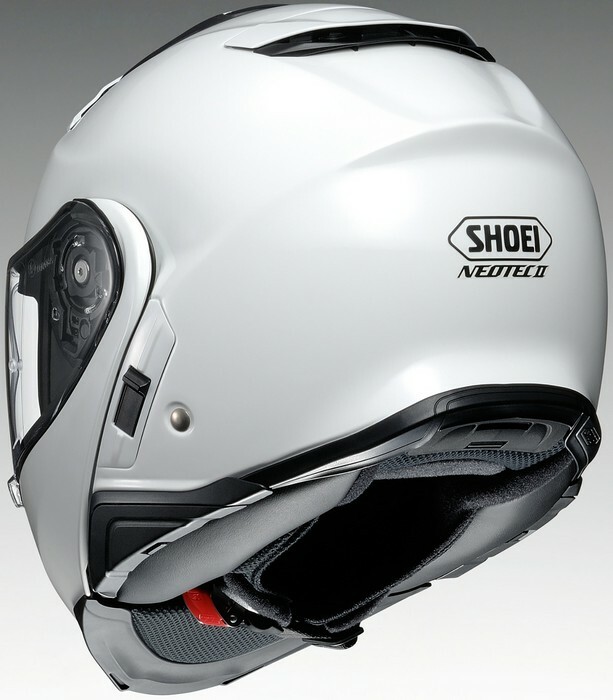 SHOEI?s NEOTEC II includes a built-in QSV-1 sun shield that offers instant relief from sun glare with the use of a large, easily located switch. The distortion-free view blocks 99% of the sun?s damaging UV rays, and exceeds ANSI Z80.3-2010 standards for non-prescription eyewear. The helmet?s outer shell forehead area is raised slightly to accommodate the internal sun shield. This allows the integrity of the helmet?s inner EPS liner to remain intact. The NEOTEC II?s EPS liner provides enhanced impact absorption by utilizing varying densities of foam. Cooling air is allowed to travel unrestricted through tunnels in the EPS. Precise placement of multi-density EPS material yields a more compact, lightweight design. The removable interiors of the NEOTEC II are three-dimensionally shaped to match the contours of a rider?s head, with multi-layer cheek pads for improved comfort and helmet stabilization. All interiors are adjustable, washable, and replaceable. The ?Noise Isolator? cheek pads have been developed to help deflect wind and reduce noise. Q: Hi, I want to buy this helmet with the srl bluetooth headset, when do you think you will have them in stock? A: The new SHOEI Neotec II will arrive late March 2018, you may call to reserve yours today. Q: I am from Denmark, but are located in NC next week in hotel Homewood suites. I would like to bye a Nerotec 2 black size L 0116-0105-06 incl Sena SRL. Will you give me a special offer? Look forward to hear from you. Best regards Poul Looks like that the list price is all most the same everyware. A: Yes, you can go from 35mm pads to 39mm to make it tighter, this will help in reducing wind noise, there are no other adjustments for noise, at this moment the 39mm pads are on order but we don't have a date of arrival to the warehouse. Q: How does the com system work for Gold Wing riders who use the cable to helmet connection for the Honda OEM CB radio? A: The SHOEI NEOTEC 2 SRL bluetooth system is not designed to work with CB radios, however,. we can install a corded headset that plugs to the bike's 5 pin jack on the bike, you can look at J&M or IMC on our headset section. Q: This helmet comes with bluetooth correct? Also, what helmets of Shoei or any other brand have transition visors? A: The SHOEI Neotec II does NOT include the SENA SRL, SHOEI makes transition shields for the X14, RF1200 and the RF-SR only, BELL makes the qualifier DLX that includes the transition shield.